Let me preface this by saying that I don’t live in DC. I don’t vote in DC. I have no vested interest in who wins the race for Mayor. Based on what I’ve been told, because she can’t get a vote out of me, Muriel Bowser won’t listen to what I have to say. Muriel, you need to listen. 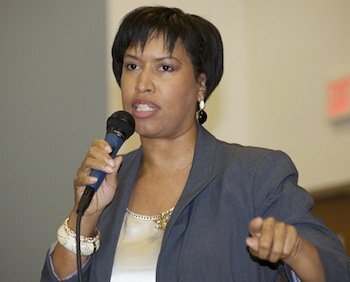 It has been reported in the Washington Post that Muriel Bowser doesn’t have the support of most Black Women in D.C. You can read that here. I wondered about that. Why wouldn’t she have the support of black women? It made no sense to me. We even addressed it on our show, The Round Table. Last night, I got a better feel for what the problem is. During the last televised Mayoral Debate of the DC Candidates, Muriel Bowser was asked about her lack of support from Black Women. Bruce Johnson asked about a recent article in The Washington Post regarding Bowser. Bowser: Women judge women the most harshly. What we have done every day for the last seven years is we go out and talk to everybody. What that article also said is that we are growing and we have room to grow. The latter part of Bowser’s response was fine. The first part, however, not so much. Why on earth would she say such a thing? It’s as if to say that black Women in DC can’t get past catty, jealousy, to be able to make an informed, thoughtful decision on to whom to give their support. I had to ask twitterverse if that was what she actually said. Funny thing, my tweet ended up on WUSA9 news last night, and I’m glad it did. This is a problem that needs to be addressed. I couldn’t believe a seemingly intelligent WOMAN would say something like that about other women. Other Black women! Make no mistake about it. If a man had singled out a group of women with that statement, he would be persecuted for being misogynistic and stereotypical, among other things. Just because Muriel Bowser is a woman, does NOT give her a pass. Don’t forget she is a woman who was endorsed by Emily’s list. I’m quite sure some of the money she has received in order to run such a competitive race came from BLACK WOMEN. According to some VOTING Black Women in the District, Muriel Bowser has not reached out to them. It is felt that she doesn’t care about the poor, let alone what she deems as poor Black Women. Perhaps she thought the support from Black Women would be a lock for her, and that she didn’t need to reach out and let these women know that she not only wants their vote, but RESPECTS their vote. A lot of women, as you see in the Washington Post article cited earlier, don’t even know who she is. Is that the fault of the voters? Absolutely not. It is the fault of Muriel Bowser. A comment such as the one made last night during the debate is the fault of Muriel Bowser. The lack of support she has from D.C. Black Women is the fault of who? You guessed it, Muriel Bowser!! One voter told me the story of an encounter she had with Bowser in Ward 5. According to the voter, a Black Woman, Muriel came to the home of her employer, doing the ususal “knocking on doors” campaign routine. When she answered the door, Muriel asked for the owner of the home. First, how did Muriel know the woman wan’t the owner of the home? Assume much, Muriel? After finding out the woman was the nanny, Muriel turned around and walked off, without saying another word, until the woman said she lived up the street, and was a voter in D.C. At that point, Muriel turned back around, all smiles. Read the entire story here. This woman, her family, and the employers to whom Muriel was prepared to skin and grin with intitially, all have said they would not vote for Bowser because of this incident. You can’t treat people like trash,and then expect to get their treasure, their vote! Voting is one of the great equalizers in this country, and no matter who, what, when, and, where, each person has a vote. Now you guys in D.C. have to let me know if Muriel Bowser shows up at some Black Church this Sunday for some photo ops with Black Women. Something tells me after this fiasco, she is sure to do something like that. Just know, whoever she finds to do some photo ops with, it isn’t because she cares. She is trying to do some damage control. Whatever Church she ends up at this Sunday, she certainly isn’t seeking The Lord. I hope Muriel Bowser apologizes to the women of D.C. for her comment last night. It would be the right thing to do. People slip up and make stupid comments all the time. What matters most is acknowledging it, fixing it, and moving on. Black Women vote, Muriel, and right now it isn’t looking like the majority of them are voting for you. Besides the political element, Bowser hasn’t stood up for DC’s working class population. This city has undergone significant gentrification since 1998. That had it’s good and bad elements, sure. But one thing that is certain is that much of DC’s black middle class has been sent to the suburbs. Thus, much of DC’s remaining black community is made up of blue collar workers. Many of these blue collar African American families are headed by black women who work in minimum wage jobs. For me, a left leaning non-native who has gotten to know this city over the last 15 years, it’s been a point of pride that this city’s council and Mayor are progressive. This is a very liberal city. So when the Council voted to raise the minimum wage to a “living wage” (the proposal was $12 an hour), it as disappointing that she voted no. Bowser, as a Councilwoman, chose vested business interests and her campaign donors over her own constituents. Bowser was the swing vote. Her support would have meant an additional $4 an hour, or $8,320 a year for literally, thousands of black women in dc. Who wants to vote for someone who’d willingly take $8320 out of their pocket? Your article is kinda harsh on Muriel Bowser. Is this another form of “crab mentality”? I don’t believe her comments were AS IF to say “black Women in DC can’t get past catty, jealousy, to be able to make an informed, thoughtful decision on to whom to give their support.” Come on! can YOU give us more respect than that?? I am a D.C registered voter and although I am a fan of Vincent Gray it is certainly not because I feel that Muriel Bowser does not respect me as a black woman. Having met Ms. Bowser several times and being a long time resident of ward 4 where she holds the Council seat, I feel she represents black women, AND the people of her ward well. You also mentioned in this article that “Muriel Bowser has not reached out to them. [Black women] It is felt that she doesn’t care about the poor, let alone what she deems as poor Black Women.” Why would YOU equate black women in the District as being POOR? some are and some aren’t! At some point it is up to US to know who represents you; who who your candidates are and what they will do for your community. I don’t expect all the candidates to reach out to me personally. That may not be possible. Don’t be another black woman shining negative light on this sistah! Wish her well! From one black woman to the next. P.S Just going to a “black church” to do photo ops will not get you black votes! There are many many more avenues of connecting with the people of DC! You are entitled to your opinion, and I am entitled to mine. Based on the polling of Black Women in DC, I don’t think I’m far off in my assessment of Muriel Bowser at all. Now why don’t you go back and re-read my post, especially about how Muriel Bowser treated a woman who she thought was “just the help”. Have a great day!! I’m a female DC voter and totally agree with you. Although it was not Murial, but a member of her team came to my door (she stood back chatting) and asked for the owner. I’m the owner and owned another property up the block…I simply said bye and closed the door. People think because they get big corporate dollars and have advertisements all over the place that voters are dumb enough to vote for them. Bowser’s problem is the same as Fenty’s, Rude and arrogant. Yes…it feels very much like Fenty during his second run was his guard was down. I watched the debate she never mentioned black women she was very general….. We need a classy black woman to represent DC! Can’t wait till Tuesday when she’s elected. I voted for Muriel and will encourage other black women to do so. I actually have induce on 100’s of DC black women and she wil prevail… This poorly written blog means nothing. DC Democratic Voter frOm Ward 7! I would probably take your point of view seriously if not for the fact that you are posting from Philadelphia. Furthermore, when you talk about “poorly written”, you must be referring to your grammatically incorrect post. If you indeed watched the debate, as you claim, you would know what the question was that Muriel Bowser responded to. Just because Muriel Bowser is a Black Woman is no reason to give her a pass on disrespecting the intelligence of other Black Women. Now you run along and have a nice day! Oh, and tell whoever put you up to posting to use someone from DC next time! Kisses! I have met her and I think she is just want DC needs. I feel she cares about everyone . She MAY be what DC needs, I don’t know, but what I DO know is that the remark she made about the Black Women in DC who don’t support her was inappropriate. I’m surprised this article received as much interest as it has. As a black women WHO LIVES IN DC, I would like to proudly support Muriel Bowser! I believe she has gotten a lot of unnecessary slack from our fellow sistas. The harsh reality is that many of us, of course not all, but many of us simply do not warmly embrace or support one another. And this is a sad FACT. This article is a prime example of that. You could have focused on the political issues of this campaign. But instead you chose to pull attention away from these serious issues that affect so many of us living in DC to highlight why WE don’t LIKE HER?? This is a campaign. At least have your opinion grounded in substance!!! But then again, I agree with Muriel’s statement that women judge women the most harshly. And in this case, unfairly. On April 1, I will vote for Muriel Bowser because she’s driven economic development and has supported a number of public investments in her Ward. I value hard work, and she is one of the hardest and most resourceful leaders I’ve seen. Not only has she spent countless hours trying to meet the citizens of Washington DC to hear their issues, but I believe she actually cares about the future of our city. Her policies on transportation and affordable housing reflect that. Not to mention the fact that she is the biggest proponent for having senior citizens age in place? She is also committed to improving our severely broken education system. This is a great foundation for DC’s next mayor! I’m not surprised it has received as much interest as it has. It is a topic that “interests” people, clearly, by the amount of people all over the country, and outside of the country, reading it. That being said, you can PROUDLY support whomever you choose, as can anyone else. What I find interesting in your comments, is that you think other “sistas” have given Muriel Bowser unnecessary slack. You consider yourself prudent in the issues affecting DC, right? Well why can’t it be that the other “sistas” are just as prudent and simply don’t support Muriel Bowser? Why do they have to be “hating”, “judgmental”, or anything else to suggest that their right to support who they want to support is not as valid as yours? Now to answer your question about why I didn’t focus on the political issues of the campaign, it is VERY simple. I didn’t want to. I focused on a remark that was made about other Black Women that I felt was sexist and inappropriate. Since Muriel Bowser doesn’t have 100% of the support of every person living in DC, does that mean they are judging her more harshly? Why single out one group of non-supporters to suggest that their non-support is based on anything other than the issues? I can guarantee you that there are people who don’t support Muriel Bowser because she is black. Would she EVER come out and say that on television? Of course not. You see, my dear, when you cast a net that wide and that general, you don’t know who you are offending. I was offended, so I wrote about it on MY blog. I really don’t think that is difficult to understand. Enjoy your day! MKA – It wasn’t Leslie who chose not to focus on the political issues of the campaign, it was Bowser and I think you need to consider her comment when asked during the debate. When the moderator asked why black women didn’t appear to support her, she could have used that opportunity to discuss her political views “grounded substance” as you call it, to speak directly to them. Instead, her answer was not political, it was emotional – because we don’t like each other (to paraphrase). Women that were supporting her are now left reeling from such an absurd comment during a debate, seriously a time to put your best foot forward and stand up for the “sistas.” She could have said “women are smart, they have their hands full, most in DC are single mothers,” or something that showed she had their back even if the polls might say otherwise. It was a loaded question and one she should have expected so I’m pretty sure that her team thought blaming women for not wanting others to get ahead was a good strategy. It was clear in her comment that it was discussed by the way she answered. It also painted a negative light on all women, in my opinion. She went against the Girl Code in a public forum – Choosing the “boys” over the “girls” and suggesting by her answer that women could never pick a winner because we’re too blinded by jealously. She would have been wise to issue an apology and restate what she meant. Come on! Its not that serious. As long as she displays compassion, leadership skills and has a positive vision for the City, we should continue to support her! No one is perfect! We all have our biases etc..She’s human…We judge too harshly based on profession verses Character.